Since I started university I have learnt so much, and it was exciting to use all my skills to create my first garment and portfolio. 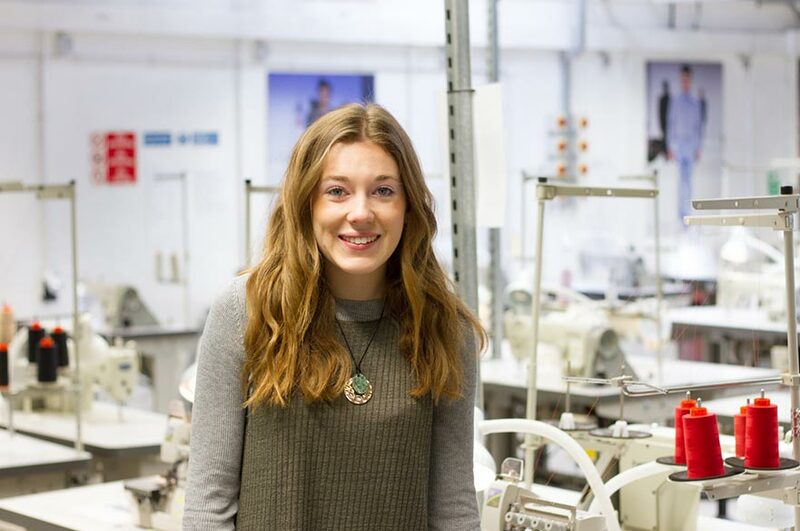 Eleanor is a Year One student on our BA (Hons) Fashion Design course. Here she tells us about the highlights of her first year at NTU and what she loves about her course. "The course detail really interested me and the University has such a high reputation, due to the strong links that NTU has with industry. When I attended the open day I had a good feeling about the University, more than any other I visited – it just felt 'right'. I loved how enthusiastic and creative the students were, and how passionate the tutors were. That came across very strongly." "It was very well organised, which made it easy to start university life and to start being a student at NTU. There was such a variety of events and experiences arranged so you could get an immediate taster of what NTU has to offer and how to sign up to all the societies." What was moving into halls like? "Moving into halls was the thing that I was most nervous about when starting university, but NTU made it really easy and a relaxing experience – the whole process was very well organised. Students from Year Two and Three were at the halls to help you move in, carrying things from the car (the parents liked it too!) and introducing you to other people on your floor and in other flats. There were also several events in the first week to help you get to know people in your halls, and there are inter-hall competitions and sports events, which are really fun, and everyone is encouraged to get involved." "I most enjoy the variety that fashion design offers. Right from the beginning of the course you are introduced to all disciplines and areas of fashion design and are given the opportunity to develop your skills in lots of different ways." Could you tell us about any guest lecturers you've enjoyed? "I recently attended a Fashion and Textile Insight Evening which was organised by the University. Lots of people from industry with different backgrounds and specialisms came and spoke to us. We had the chance to ask questions about their careers and a chance to network with them and the other students who attended. It was a good insight into where my degree can take me." "All the tutors help develop you to become the best designer you can be, but not only this, they help you understand the fashion industry as a whole and guide you to find where you stand in the fashion industry. They are willing to spend time with you individually and are extremely supportive when you feel like things aren't going so well and help you resolve any problems you may have. The administrative staff are helpful and well-organised." What you are the facilities like? "The studios are bright open areas with plenty of space for everyone to work. By working with all creative subjects in one building, it means you have all kinds of facilities and equipment right at your fingertips. We have Bonington Gallery in our building, which is a constant source of inspiration, and it's great that we have somewhere which is open to show our work, and also people from the wider Nottingham community can come and view it. It's also helpful having the shop close by, and it's well stocked, the staff are knowledgeable, and helpful with specific requests. "The University isn't a traditional campus, but the buildings are close together and it feels quite compact so it is easy to get around. The library is well-stocked and an excellent resource for research, and the staff provide great support. They put on specific sessions for any technical help you might need and these are extremely useful, especially when you're just starting university." What has your highlight been of your first year at NTU? "The highlight of the year so far was to finish my first fashion design project at NTU. Since I started university I have learnt so much, and it was exciting to use all my skills to create my first garment and portfolio." "Nottingham is such an exciting and diverse city and in close proximity to the university. It's the perfect place to be an inspired student – it's a young, vibrant and a cool place to live (and the nightlife is excellent too!)." "Fashion Design at NTU is an amazing place to learn – it's the perfect mix of creative and academic. You get a very high amount of contact time with tutors, and can be inspired by the city and all the other students living and learning alongside you. It gives you the perfect opportunity to enjoy university life whilst giving you the best possible education ready for you to face the fashion industry."